Wagner® is the innovator in braking technologies for passenger car, medium-duty and commercial applications. Wagner sets industry standards with leading engineering expertise and a commitment to ensuring that our parts deliver superior braking performance. 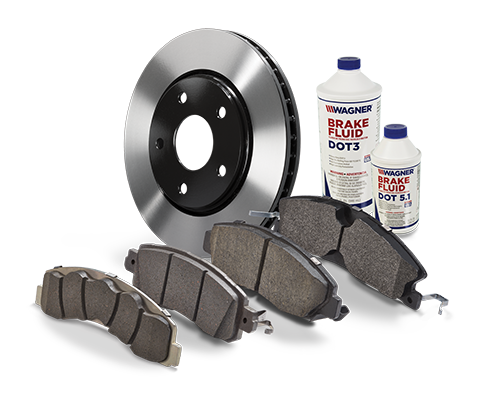 With comprehensive coverage, Wagner Brake provides all the components necessary for a complete brake repair. Our premium products offer exceptional quality for all the latest applications. Wagner® lighting products have been on the leading edge of auto lighting since the development of the sealed-beam headlamp. With an exclusive focus on automotive lighting, customers benefit from proven expertise in engineering and manufacturing OE components for the world's major automotive manufacturers. With comprehensive coverage, Wagner is enhancing driving visibility and safety for all your automotive replacement lighting needs. *Results based on 60 MPH post fade performance testing conducted by Link Engineering Company comparing Wagner Brake pads to competitor's brake pads on the 2014 Ford F-150, 2011 Toyota RAV4 and 2013 Chevrolet Tahoe. Wagner introduced to the marketplace Wagner TruView® PLUS LED miniature lamps, engineered to deliver 10+ years of performance, while projecting a whiter, brighter and deeper pattern of light. Wagner ThermoQuiet® CeramicNXT® formulations meet OE21™ Low Copper requirements eight years before mandate. Wagner incorporated ThermoQuiet® CeramicNXT® brake pad formulations for low copper, less dust and longer pad life. Wagner launched a new premium line-up of capsule lighting, including Wagner NightDefense™, Wagner BriteLite™ and Wagner TruView® PLUS, with differentiated features and benefits. Introduced Laser-Shaped Friction™ technology into the ThermoQuiet® line. Wagner opened a state-of-the-art testing facility in Plymouth, Michigan. Wagner Brake recognized for automotive innovation. Wagner Brake re-launched as a full line offering. As part of its acquisition, Federal-Mogul obtained the Wagner Lighting brand from Cooper Industries. Developed for light truck applications, Wagner ThermoQuiet® LT featured exclusive Integrally Molded Insulator (IMI™). Dual cylinder brakes systems were introduced by Wagner based on a concept the company had patented in 1926. Wagner developed the dual-tandem master cylinder. Wagner merged with Tung-Sol to become the largest manufacturer of automotive light bulbs. Wagner pioneered the use of high-temperature-resistant rubber compound and high-boiling-point brake fluids. Wagner plant capacity doubled in ten years and Wagner now employed a record 8,000 employees. Studebaker introduced Wagner self-adjusting brakes on its’ vehicles. As automobile lighting transitioned from acetylene fuel and kerosene lanterns, a new industry was starting to grow, that of electric light bulbs for automobiles. An early player in market was Tung-Sol. Wagner engineers, always looking for new opportunities and applications, began to look at the horseless carriage, as the automobile industry moved beyond being a rich man’s plaything in the Gay Nineties to a true growth industry for the world. Wagner experimented with electric starters, electrical charging stations, storage batteries and even built a prototype electric car. H.A. Wagner started the Wagner Electric Manufacturing Company in two rooms on Olive Street in St. Louis, Missouri. The company’s first product was a self-starting motor for a desk fan, meaning no more hand cranking, a major breakthrough, as the electric fan held much the same appeal in the 1890s as air conditioning does today.